In a sense, this isn’t a reprint. I conducted this interview with Ghosh just after he won the Arthur C. Clarke Award for The Calcutta Chromosome. It appeared for a while on the Arthur C. Clarke Award website, then disappeared. It has never appeared anywhere else. Paul Kincaid: What is your reaction to winning the Arthur C. Clarke Award? Amitav Ghosh: I’ve admired Arthur C. Clarke’s work for years and I am absolutely delighted to have won the Award that’s named after him. Paul Kincaid: Were you conscious at the time that you were writing a science fiction novel with The Calcutta Chromosome? Was it intentional? Amitav Ghosh: I was aware that I was using science-fictional elements in the book, but I don’t really think of The Calcutta Chromosome as being a genre novel. Science fiction tends to lie very squarely within the domain of the world’s richer countries and it was a challenge, as an Indian writer, to write about science. I suspect I am the first Indian writer (possibly the first writer from an underdeveloped country) to win a science fiction award. This is one of the reasons I’m so delighted to have won the Arthur C. Clarke Award. Paul Kincaid: How familiar are you with science fiction? Amitav Ghosh: I love science fiction and always have. As a child I devoured Edgar Rice Burroughs (the Mars books), Jules Verne, even H.G. Wells. I love the Wyndham books (especially The Day of the Triffids) and also Asimov and Ballard. My absolute all-time favourite is, inevitably, Lem. I’d like to add here that the great Indian director Satyajit Ray (a fellow Calcuttan)also wrote wonderful science fiction in Bengali. It is widely believed that E.T. was based on an original idea of Ray’s. I loved Ray’s science fiction stories as a child. Paul Kincaid: What first attracted you to the story of the research into malaria? Amitav Ghosh: I used to pass the Ronald Ross memorial in Calcutta several times a week and it kindled my interest both in malaria and in Ronald Ross. About ten years ago I had a bout of malaria myself and it had a profound effect on my thinking about the human body and its relationship with disease. Malaria was a strange and hallucinatory experience, but not at all frightening. In fact it was in an odd way very comforting. Then an anthropologist friend of mine, an Englishman, who was working with a tribe in a remote and mountainous part of Orissa (in Eastern India) told me that the people of this tribe thought of malaria as a friend and a protector – a barrier against the encroachments of plainspeople and other strangers. When I began to look into the history of malaria I found that the disease has historically been a fairly benign one: it took very few lives. This has changed over the last couple of decades. Malaria has mutated in response to new drugs and has become a really deadly killer: statistically it is now the single most deadly disease in the world. In other words science has succeeded in making the malaria situation much worse than it ever was. Paul Kincaid: You use this story to make two contemporary points, first about the role of the colonist who exploits but is largely ignorant of local culture and knowledge, and second about the very different attitudes to knowledge and research in East and West. The way these two points work together now seems the lynchpin for the whole novel, but were they there right from the start and how did they develop? Amitav Ghosh: A very interesting question. To tell you truth I didn’t begin with these presuppositions at all: they leapt out of the pages of Ross’s Memoirs. I think you’d be surprised if you knew how close the story is to the facts. For example: Lutchman was a real character; he appeared in Ross’s life exactly as I described (based on Ross’s own account); its Ross who tells us that he learnt about the difference between species of mosquitoes from Lutchman; Lutchman in turn learnt about this from villagers in the Nilgri mountains. Similarly Ross made all his major ‘discoveries’ working with the blood of a single patient in Secunderabad – Abdel Qadir. It was only in Abdel Qadir’s blood that he was able to see certain transformations in the parasite. Equally, it was an (unnamed) Indian assistant who pointed out the final crucial developments in the parasite to him. But does Ross ever give any credit to Lutchman or anyone else? Forget it: he didn’t even know their surnames. Paul Kincaid: Do you think local people with their empirical knowledge could, or would, have directed research the way you present? 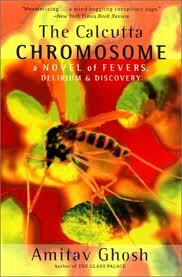 Amitav Ghosh: Ross’s work made such a huge splash because it ‘proved’ the connection between malaria and mosquitoes. Ross deserves a great deal of credit for this because his work was indeed a very elegant piece of research. but in effect much that he ‘proved’ was already well known amongst common folk in India and Africa. Ross’s Memoirs clearly show that he used folk knowledge in advancing his work. His real achievement then, lay in translating folk knowledge into the language of science. Clearly local people were well ahead of Ross in their knowledge of malaria. But would they have directed research in the way I present? Look at it this way: Ross made a major breakthrough in science based upon a very partial acquaintance with folk knowledge. It follows, surely, that someone who was better acquainted with that knowledge would do even better, especially if they happened to pick up a fluency in the language of science. Paul Kincaid: You present the Indians as having a very different attitude towards research and the acquisition of knowledge, and being naturally secretive about the results. Is this a part of Indian culture? Amitav Ghosh: I think Indian scientists and mathematicians do have a very different approach to research. The best example is the mathematician Ramanujan, who acquired his understanding of numbers from his mother who was a traditional numerologist. The botanist Jagdish Chandra Bose (another Calcuttan) is another good example. His work was later to inspire the book: The Secret Life of Plants. Paul Kincaid: Where did the idea of the secret society dedicated to achieving immortality come from? Amitav Ghosh: From the Egyptian Gnostics. Since you’ve read In an Antique Land you’ll know that I have interest in various kinds of Egyptian arcane. In the cosmology of the Alexandrian philosopher Valentinus the twin principles of divinity are Silence and the Abyss. Paul Kincaid: What turned The Calcutta Chromosome from being a historical novel into a multi-layered novel spanning more than a century? Amitav Ghosh: I never thought of the book as a historical novel. What I wanted to do was to integrate the past and the present. I think it’s a pity that science fiction always seeks to project into the future: it’s just as interesting to project into the past. Paul Kincaid: You include in the book a lot of comments about things ranging from the role of women in Indian society to Indian literature. Did you see the book challenging assumptions – and how has it gone down in India? Amitav Ghosh: It’s gone down very well: I’ve got the best reviews I’ve ever had and a major Indian film-maker wanted to film it. Paul Kincaid: One of the incidental delights I enjoyed about the book was the ghost story set at the abandoned railway station. In its own right it struck me as one of the most effective traditional ghost stories I’ve seen in a long time. What led you to include it in the novel? Amitav Ghosh: I love ghost stories. A lot of contemporary science fiction is based on traditional ghost story techniques (eg, the film Alien). Paul Kincaid: You mentioned in your letter that the book might be filmed. How easy do you think it might be to film the book? Will you have a hand in the script? And how would you consider changing the story to make it work on screen? Amitav Ghosh: The film maker’s name is Gabriele Salvatores. He’s Italian and he made the Oscar-winning film Mediterraneo. He’s also recently made a virtual-reality film called Nirvana. Paul Kincaid: As far as the science fiction world is concerned you seem to have appeared from nowhere. But I know your previous book, In an Antique Land, which I enjoyed very much and I know that there are several previous novels. What was the artistic and literary development that led you to The Calcutta Chromosome? Amitav Ghosh: Science and science fiction are old passions of mine. My first novel, The Circle of Reason (1985) was partly about a man who becomes obsessed with Pasteur and the germ theory of disease. Paul Kincaid: Finally, after the success of The Calcutta Chromosome, would you consider writing more science fiction in future? Amitav Ghosh: Absolutely. I had great fun writing The Calcutta Chromosome and I’m sure I’ll come back to those themes some day.